Back for one final post, again, help me in welcoming my good friend, fellow old book collector, and Etsy purveyor of all things vintage modern and awesome, Thingummery. It’s pretty hard to talk about Dare Wright’s Lonely Doll series without talking about Dare Wright. This isn't generally the case with children’s book authors. 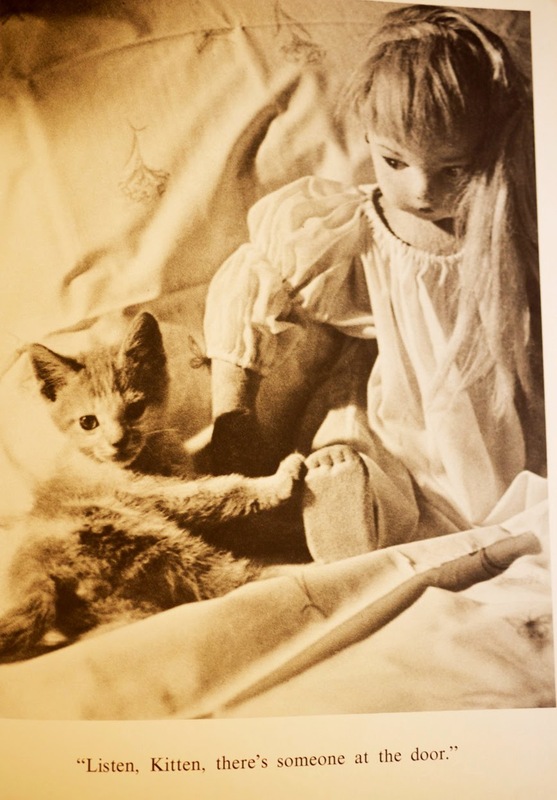 Though I’m always curious to read biographies of my favorites, I don’t actually need to know about the personal life of William Stieg or Margaret Wise Brown to appreciate their work. 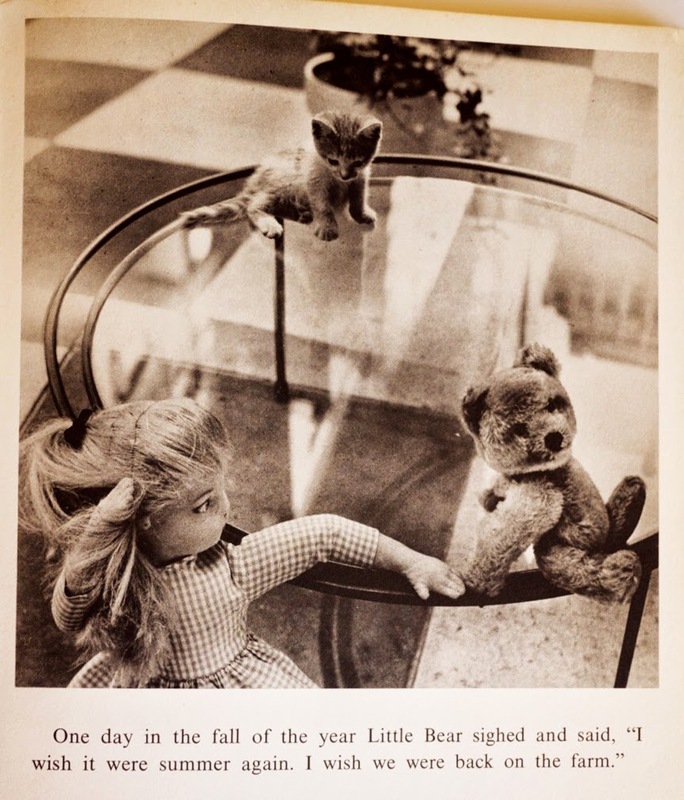 Dare Wright is a different story, because her stories—about a pretty, narcissistic doll and her surrogate family of Steiff stuffies—are so oddly beautiful, so unsettling and also share an uncanny resemblance to Wright’s own deeply unsettling, very sad life. 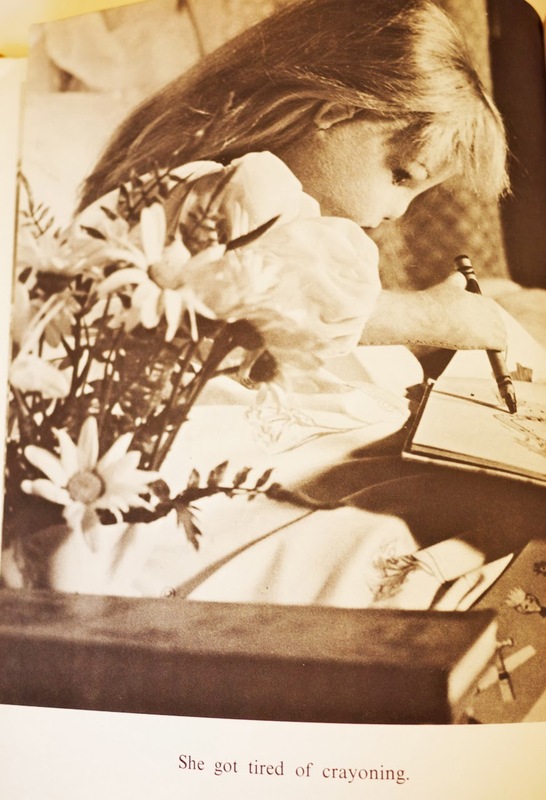 You can read the 2004 biography The Secret Life of the Lonely Doll by Jean Nathan for all the chilling details; I read the excerpt in Vanity Fair and then immediately bought the book, but I've never read the whole thing. It’s just too sad. The nutshell is that in 1917, Dare’s parents divorced when she was just three. Her father, a theater critic, moved from their home in Cleveland to NYC with her beloved older brother, leaving Dare alone to contend with her overbearing mother Edith, a society portrait painter. 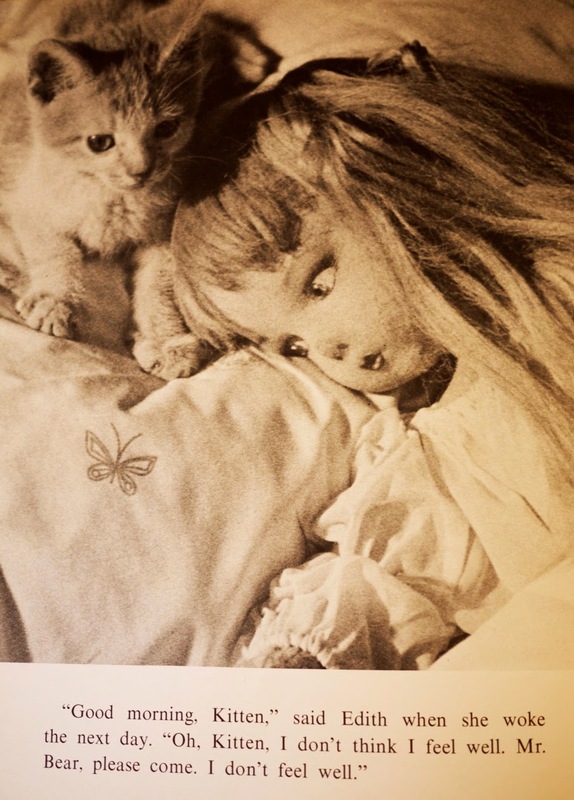 Oh, and Edith just happens to be the name of the titular Lonely Doll, who just happens to look exactly like Dare. According to the biography, the mother-daughter relationship was very intense, very strange, and much has been made of the fact that as adults they shared the same bed and that Dare never married and quite possibly remained a virgin her whole life. It’s all very Grey Gardens/What Ever Happened to Baby Jane type stuff. 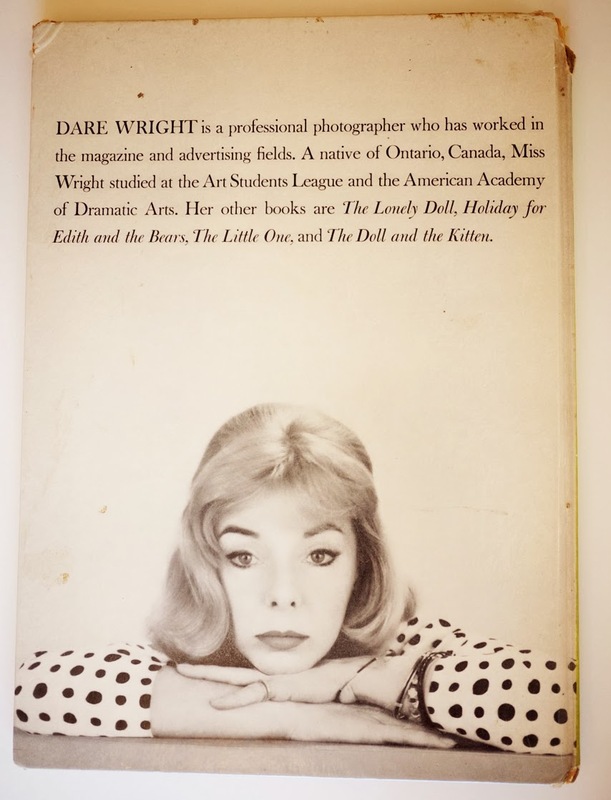 After Dare finished high school, they moved to NYC, where she struggled as an actress, succeeded as a high fashion model, but ultimately preferred to work behind the camera, as a fashion photographer and then as the author/creator of the books that would become her life’s work. 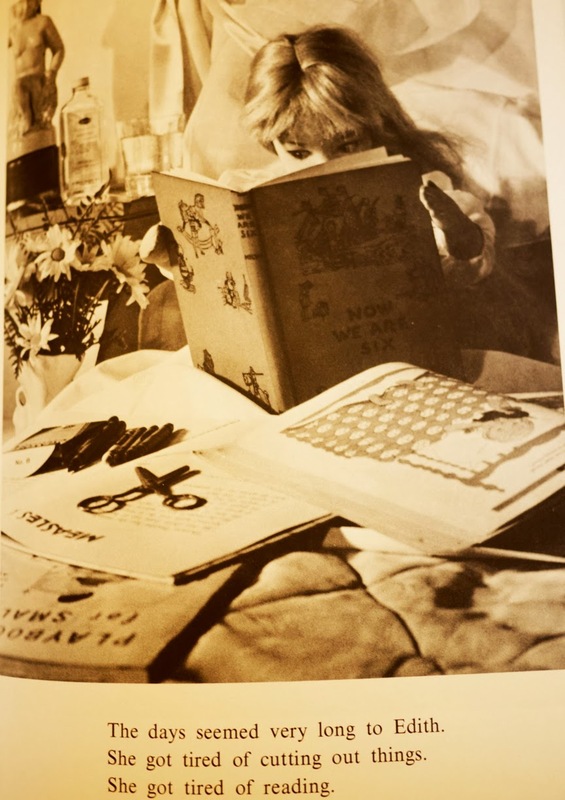 Today, those books enjoy an illustrious cult following: A New York Times article from a few years ago name-checks all sorts of literary/fashion/music icons who admire her, including Kim Gordon, Anna Sui, Steve Meisel and David LaChapelle. 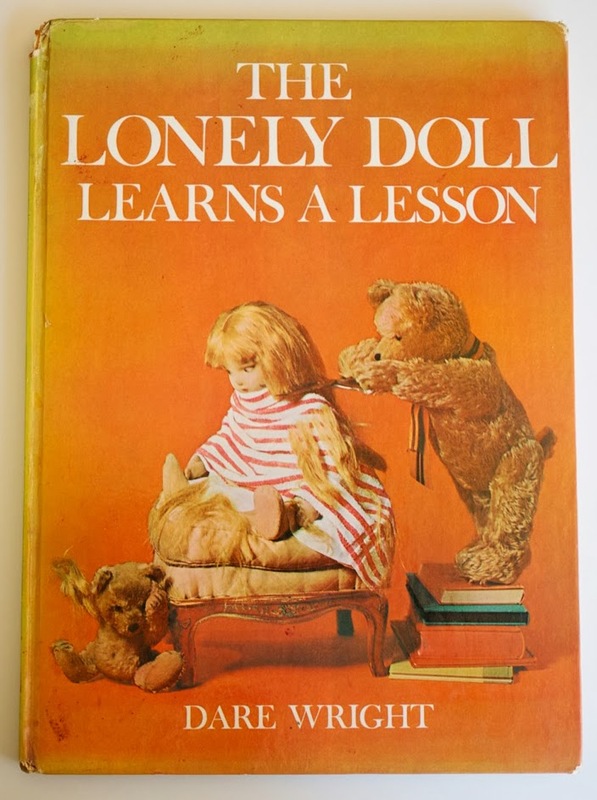 There are ten books in the Lonely Doll series, three of which were reissued in the late 1990s by Houghton Mifflin (including the first) but I’m writing up The Lonely Doll Learns a Lesson because I scored the first edition at a library sale a few years ago. 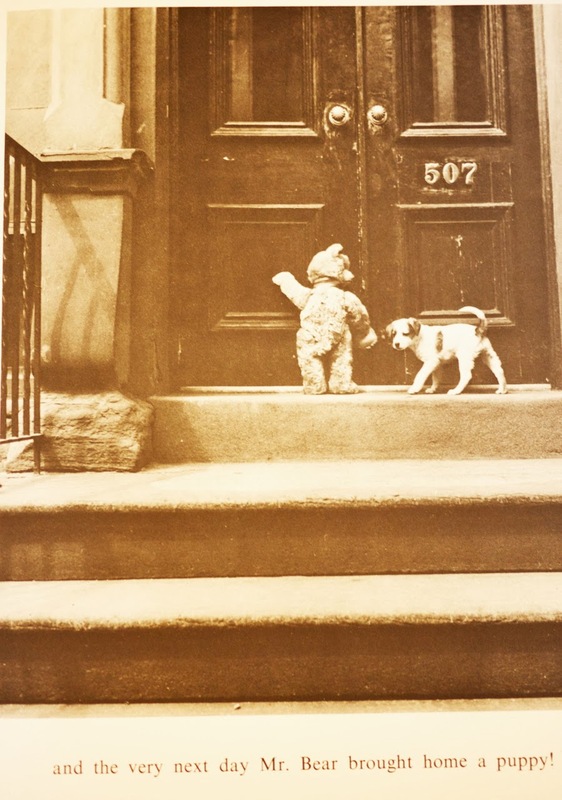 To sum up the first book, which was published in 1957 and introduces the characters—and the controversy surrounding them—Edith is a despairing doll living alone in a grand NYC mansion until one day two stuffed bears inexplicably arrive on the scene. Stern Mr. Bear becomes a father figure; his presumed son Little Bear becomes her brother and best friend. Like most kids, they get into all sorts of mischief. Single dad Mr. Bear grimly puts up with it until Edith one day plays dress-up with her never-seen, never-mentioned owner’s makeup and gowns without permission, so he puts her over his knee and spanks her bottom. He also threatens to abandon her, which is more distressing to Edith than the corporal punishment (hmm… father and brother abandoning little girl… sounds familiar, right?). But it’s the spanking that disturbs (and/or titillates) a lot of readers, and it recurs in other books in the series. Which is why many adults find her stories too creepy to share with their kids, though I don’t think kids find them creepy at all (mine don’t). Adults see sadomasochistic subtext where kids only see an interesting anachronism—a misbehaving little girl getting spanked instead of being put in time out or having her iPad privileges revoked. In The Lonely Doll Learns a Lesson, Edith doesn't get spanked for her bad behavior—she gets measles. 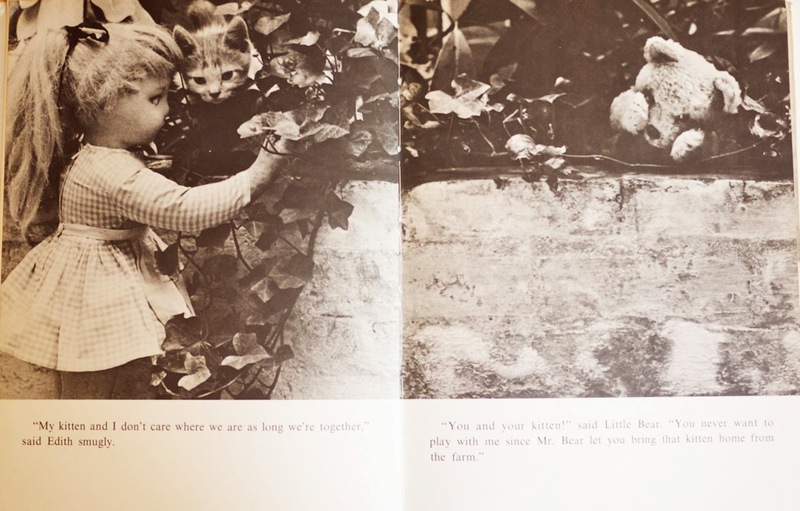 The story begins with Edith enamored of a new kitten and Little Bear feeling very left out. Self-centered Edith is totally oblivious to her brother/BFF’s feelings until Mr. Bear has to give her one of his lectures. She agrees to make more of an effort to include Little Bear but they still keep bickering because Edith is so obsessed with the cat. Finally, Mr. Bear has to send her off to bed and then comfort poor Little Bear, who wishes he had a dog. The next morning Edith wakes up feeling crummy. 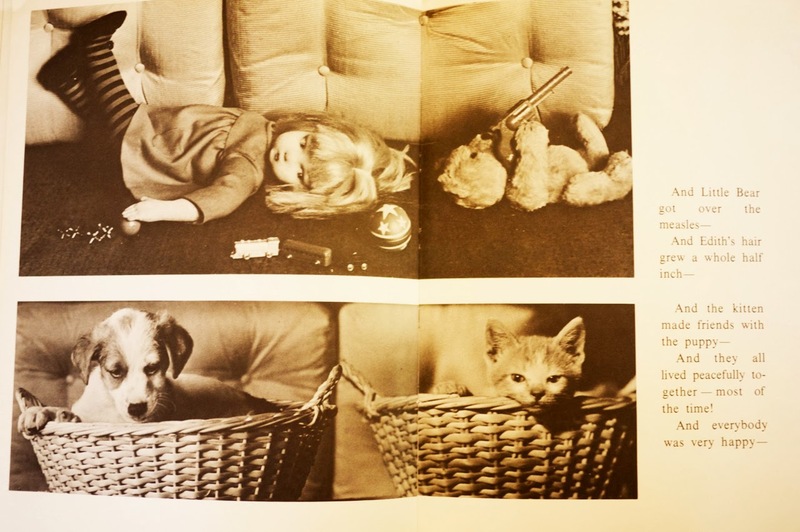 The doctor is sent for and when it’s discovered she has measles, she has to stay in bed and find ways to pass the time (I love the photo where she’s reading Now We Are Six). Little Bear pays her an illicit visit, right after the kitten has gotten all tangled in Edith’s hair. 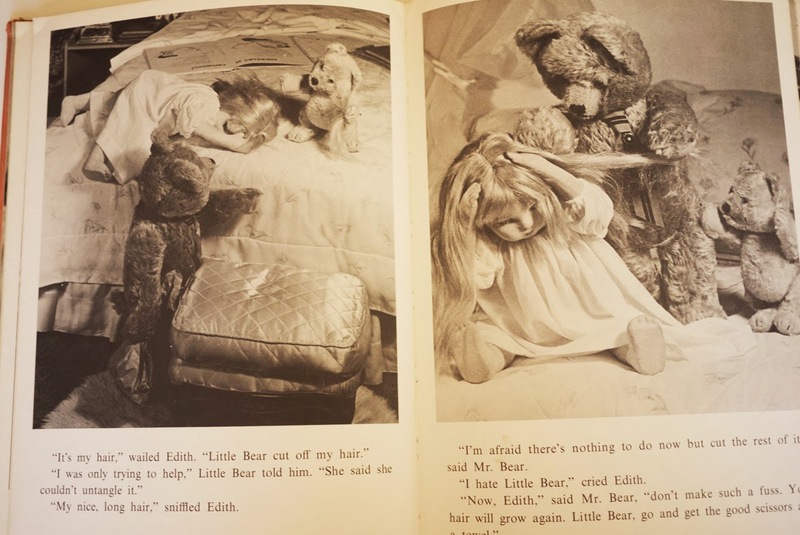 Little Bear decides to rectify matters by roughly cutting off Edith’s golden locks. She freaks out. 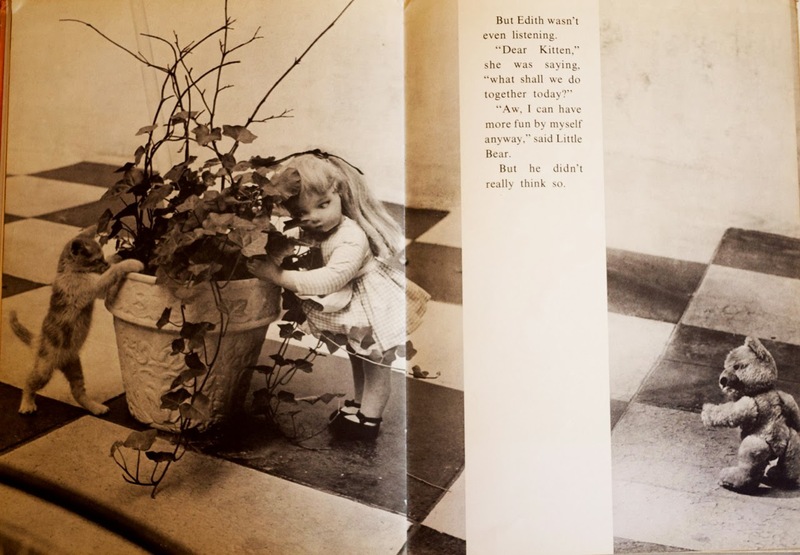 Mr. Bear rushes to see what the fuss is about, and then does the only thing he can do—he finishes the job, giving Edith quite a cunning bob. The next day, Edith is feeling better and regretful about her bad behavior. She goes to apologize to Little Bear and finds that now he has the measles too. She hatches a plan with Mr. Bear to buy him a puppy as a gesture of kindness and forgiveness, and all ends in happiness and harmony. So are Dare Wright’s books compelling if you don’t know her backstory? I definitely think so. For one thing, her photographs are beautiful (especially if you have a taste for midcentury interiors and vintage New York City). But her most impressive artistic achievement is creating a hermetically sealed world inhabited by a doll and two bears. A world that’s convincing the way a really good episode of The Twilight Zone is convincing: something doesn't feel quite right but you don’t find out what it is until the end. With the Lonely Doll books, you don’t ever have to find out—unless you choose to read about Dare’s real life. This book seems amazing!!! Nice!